4C 40.40, 2E 4309, CYG A, W 57, BWE 1957+4035, NRAO 620, 1C 19.01, QSO B1957+405, 3C 405, 1RXS J195928.7+404405, 3C 405.0, 2U 1957+40, 3CR 405, LEDA 63932, 4U 1957+40, VV2000c J195928.3+404402, DA 500, MCG+07-41-003, DB 117, Mills 19+4, VV 72, PGC 63932. Cygnus A (3C 405) is a radio galaxy, and one of the strongest radio sources in the sky. It was discovered by Grote Reber in 1939. In 1951, Cygnus A, along with Cassiopeia A, and Puppis A were the first "radio stars" identified with an optical source. Of these, Cygnus A became the first radio galaxy; the other two being nebulae inside the Milky Way. In 1953 Roger Jennison and M K Das Gupta showed it to be a double source. Like all radio galaxies, it contains an active galactic nucleus. The supermassive black hole at the core has a mass of 7039497137500000000♠(2.5±0.7)×109 M☉. Images of the galaxy in the radio portion of the electromagnetic spectrum show two jets protruding in opposite directions from the galaxy's center. These jets extend many times the width of the portion of the host galaxy which emits radiation at visible wavelengths. At the ends of the jets are two lobes with "hot spots" of more intense radiation at their edges. 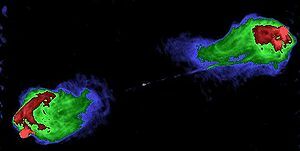 These hot spots are formed when material from the jets collides with the surrounding intergalactic medium. In 2016, a radio transient was discovered 460 parsecs away from the center of Cygnus A. Between 1989 and 2016, the object, cospatial with a previously-known infrared source, exhibited at least an eightfold increase in radio flux density, with comparable luminosity to the brightest known supernova. Due to the lack of measurements in the intervening years, the rate of brightening is unknown, but the object has remained at a relatively constant flux density since its discovery. The data are consistent with a second supermassive black hole orbiting the primary object, with the secondary having undergone a rapid accretion rate increase. The inferred orbital timescale is of the same order as the activity of the primary source, suggesting the secondary may be perturbing the primary and causing the outflows. ^ a b c d e f g "Results for Cygnus A". NASA/IPAC Extragalactic Database. Retrieved 2008-10-01. ^ a b c d e "NAME Cygnus A". SIMBAD. Centre de données astronomiques de Strasbourg. Retrieved 2016-02-29. ^ a b Graham, Alister W. (November 2008), "Populating the Galaxy Velocity Dispersion - Supermassive Black Hole Mass Diagram: A Catalogue of (Mbh, σ) Values", Publications of the Astronomical Society of Australia, 25 (4): 167–175, arXiv:0807.2549, Bibcode:2008PASA...25..167G, doi:10.1071/AS08013. ^ Jennison, R.C. ; Das Gupta, M.K. (1953). "Fine Structure of the extra-terrestrial radio source Cygnus 1". Nature, Vol. 172. p. 996. ^ Strange, D. "The Radio Galaxy Cygnus "A"". Archived from the original on July 25, 2008. Retrieved 2008-09-22. ^ Nemiroff, Robert; Bonnell, Jerry (2002-10-05). "X-Ray Cygnus A". Astronomy Picture of the Day. Retrieved 2008-09-22. ^ Perley, D. A.; Perley, R. A.; Dhawan, V.; Carilli, C. L. (2017). "Discovery of a Luminous Radio Transient 460 pc from the Central Supermassive Black Hole in Cygnus A". The Astrophysical Journal. 841 (2): 117. arXiv:1705.07901. Bibcode:2017ApJ...841..117P. doi:10.3847/1538-4357/aa725b. ISSN 1538-4357. "Cygnus A". SIMBAD Astronomical Database. Blanco, Philip (1997-02-07). "The powerful radio galaxy Cygnus A". Archived from the original on 2012-02-10. A second massive black hole has been discovered in galaxy Cygnus A (Astronomy magazine, September 2017). Information about Cygnus A from SIMBAD.